The electric remote control mirror switch allows you to adjust the position of the left and right outside rearview mirrors. 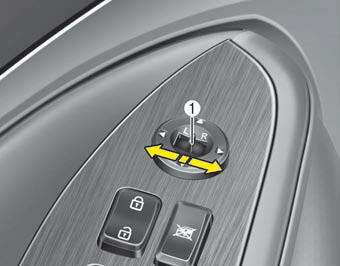 To adjust the position of either mirror the ignition switch should be in the ACC or ON position, or engine is running. 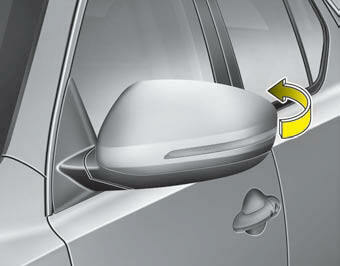 Move the lever (1) to R or L to select the right side mirror or the left side mirror, then press a corresponding point on the mirror adjustment control to position the selected mirror up, down, left or right. After the adjustment, put the lever into neutral (center) position to prevent inadvertent adjustment. • Do not attempt to adjust the outside rearview mirror by hand. Doing so may damage the related parts.